Two staffers for Virginia Lt. Gov. 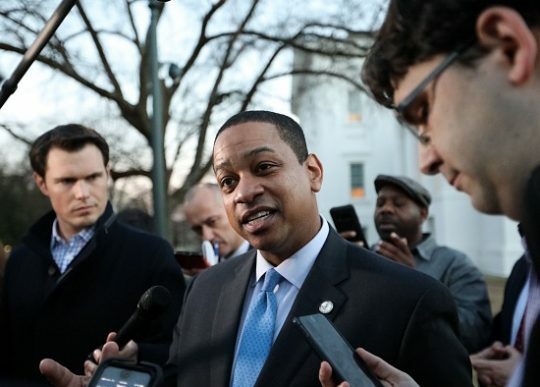 Justin Fairfax (D.) resigned in the midst of a series of scandals afflicting the state's political leaders, including two accusations of sexual assault against Fairfax himself. Fairfax's policy director Adele McClure and scheduling director Julia Billingsly both stepped down, the Richmond Times-Dispatch reports. Two employees of Fairfax's political action committee We Rise Together also resigned: Dave Mills, who was the PAC's executive director, and Courtney McCargo, a fundraiser. Mills's wife, state senator Jennifer McClellan, is the vice chair of the Virginia Legislative Black Caucus and is considered a possible replacement for Fairfax should the lieutenant governor resign. Asked why four people left their jobs, Fairfax's spokeswoman Lauren Burke said it "is a part-time office, so it’s not a big staff to begin with." Lawrence Roberts, Fairfax's chief of staff, said pressure is impacting staffers. "The pressure of constant incoming press, political and calls — our phones ring every five seconds and just trying to clear your voicemail is impossible," Roberts said. He added that replacements could be hired "if we have the time and space to make intelligent decisions." "The governor's office has 100,000 state employees. The lieutenant governor has four. So half his staff remains, and his two most senior people remain," Roberts continued. Fairfax is taking a paid leave of absence from the law firm Morrison & Foerster while an outside organization hired by the firm conducts an investigation into sexual assault allegations against the lieutenant governor. Duke University asked Fairfax to step down from the Sanford School of Public Policy Board of Visitors pending an investigation. On Sunday, Fairfax repeated his denial of the accusations and called for due process in an interview with the Washington Post. "Even in the most difficult times, including ones like these, that’s when it’s most important to adhere to our highest values as Americans," Fairfax said. "And due process is at the heart of our constitutional democracy in order to get to the truth and be true to what we are as Americans. …Everyone deserves to be heard…even when faced with those allegations, I am still standing up for everyone’s right to be heard. But I’m also standing up for due process." Fairfax also said he would not resign. Virginia's top three leaders, all of whom are Democrats, are mired in scandals. Gov. Ralph Northam faces pressure to resign after a photograph of someone in blackface and someone in a Ku Klux Klan hood was found on a page dedicated to him in his medical school yearbook. Attorney General Mark Herring admitted to wearing blackface while a student in the 1980s. This entry was posted in Politics and tagged Justin Fairfax, Racism, Ralph Northam, Sexual Assault, Virginia. Bookmark the permalink.